City of Oxford I think were one of AECs most loyal customers. According to my 1963 British Bus Fleets South Central book it states that as from 1927 apart from a batch of 5 Dennis Loline Mark IIs delivered in 1961 with AEC engines by the way, all their vehicles were AECs. Interestingly enough the next batch of vehicles ordered after the Lolines were AEC Bridgemasters. What I find strange, and I hope someone can explain why it was that the Bridgemaster had been available from 1956, why wait until December 1961 to take delivery of their first batch. Not to mention the fact that they took delivery of 15 lowbridge Regent Vs as well as the 5 Lolines in the 56 – 61 period. 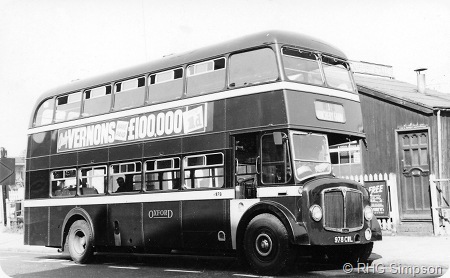 As a matter of interest they also took delivery of 30 highbridge Regent V MDs and 16 LDs in the same period of which the vehicle in the above shot is one of the first. It was chassis number 29 of the MD variant and had as can be seen an exposed radiator rather than the more recognisable concealed version more associated with the Regent V. All City of Oxford 27ft Regent Vs were MDs (Medium Weight) having the smaller AEC AV470 7.68 litre six cylinder diesel engine. But they were not quite so loyal when it came to body builders Park Royal and Weymann were the norm for the double deckers, apart from a batch of 5 Regent Vs and the Lolines that had East Lancs bodies and the first batch of front entrance Regents that had bodies by Willowbrook. I am afraid that is where my information ends but if you know something that maybe of interest to others your comments are more than welcome. Whatever the reasons; maroon, cream and duck-egg green AECs – that is the heyday of a superb operator. P.S. Re-reading Alan Townsin’s chapter on the Bridgemaster in his "Blue Triangle"….. The original version was attractive with curved profile and aluminium body but BET were likely to be the model’s biggest customer. They wanted steel frames and single skin domes, like the MCW Orion, and a wholesale re-think had to be made. Very few of the original Crossley built Bridgemaster’s were made before it was totally retooled and production moved to Park Royal from whence came the uglier production model. This probably helps answer why COMS didn’t buy Bridgemasters before 1961 – that and being on the end of a queue which would involve PRV vehicles for other customers. The Bridgemaster was now firmly based in London and would, or could, not be sub-let to Crossley or Roe. I don’t know who took this photograph but I know the setting is Gloucester Green Bus Station in the heart of Oxford. Oxford Bus Co’s livery was absolutely gorgeous, restrained and stately but still gorgeous!! Coming from a Leyland/Daimler Orion bodied stronghold on my visits to Oxford with my father in the late 1950s/early 1960s I always thought this batch had a certain refined air about it. Again, coming from the a place where the Orions were coated in acres or red or green the Oxford livery was to my eye very attractive. I was told by an ex Crossley employee who was there to the end that the transfer of the Bridgemaster to Park Royal, which was pretty much the final nail in the coffin of Crossley, would not have been so final had there been a commercially viable demand from non BET operators who would have specified the original body, leaving Park Royal to deal with the BET revamped design. As it was, no significant interest was shown and the shut down went ahead. Regarding Oxford’s order, whilst BET companies could deviate from group policy, at the time the group was pressurising its constituents to take the Bridgemaster. With a very much AEC dominated fleet Oxford found it hard to resist unlike Ribble, North Western and other fleets which had either a Leyland dominance or a more diverse fleet. While the redesigned Bridgemaster is widely regarded as a styling disaster, it is often forgotten that some of the rear-entrance examples were nothing of the kind, as is well illustrated by the photos of the Sheffield buses on Graham Hill’s site (see Phil’s brindale link above). Watching a 1963ish Youtube video on the Outwell and Upwell Tramway I saw a familiar sight: a 1949 City of Oxford AEC Regent III with 56-seat highbridge Weymann bodywork stopping to pick up a lady—and here’s the less familiar bit—who was standing on the railway track. The by then diesel-hauled farm-produce trains that ran along the roadside made only a handful of trips a day so using the tracks as a bus-stop posed little danger. I couldn’t make out an operator’s name, but I’m sure someone here knows! I should have said that the film is Huntley Archives no 521. OFC 383 here appears to have platform doors, which I thought were fitted by Smiths of Reading on acquisition. Could this bus have passed from Smiths to a third life on the Fens? If so, that would date the picture to about 1966-67. I think that the Regent III is OFC 390 which was acquired by Smith (Bluebell) of March in February 1962 and was fitted with doors for them. It lasted until March 1966. 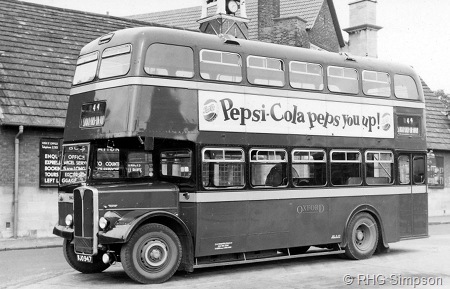 I thought that the Oxford "Country Buses" – out of town services like Kidlington – of that eras had doors from new? The Regent V was in production from 1954 until 1968 there was a prototype Regent IV which had an underfloor engine but there was not much interest so it never went into production. According to research the only difference between the Regent III chassis and the Regent V was that the latter’s rear springs were ½ inch wider. There was two differences though the first being the obvious cosmetic one of the introduction of the AEC wide-bonnet front end with the more square traditional AEC radiator. The former exposed radiator style was still available until 1960 and quite a lot were built that way. The second but not so obvious was the direct selection epicyclic gearbox to replace the preselective gearbox of the earlier Regents, although about 100 were built with preselect gearboxes for a few operators, the normal clutch and synchromesh was also available. Engine wise the Regent V had the usual AEC 7·7 and 9·6 engines and in 1966 a 11·3 litre version became available, for some reason in 1955-56 the Gardner 5LW or 6LW was available no 5LW were built but a few operators took some 6LWs. This vehicle was subsequently acquired by Provincial in 1970, becoming their no.80. It was one of seven purchased, the others being 970/2/5-7 CWL.